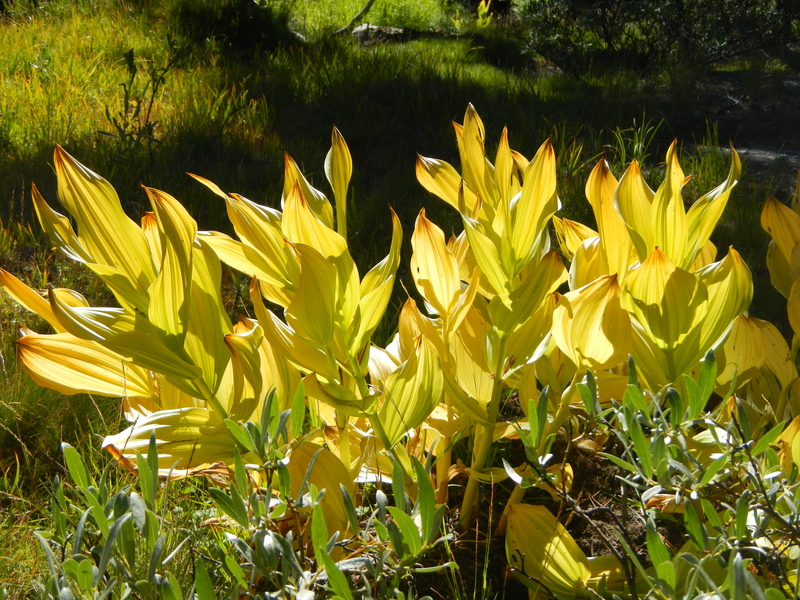 Skunk cabbage, aka California corn lily or veratrum californicum, backlit by the rising sun. It stopped me in my tracks. Hard work. Betty still felt sick, so she was moving slow We couldn’t make the miles I had hoped for. Hard to slow my pace so I stopped frequently to rest. That was probably really good, as I am not in the best of shape for starting out this trip. 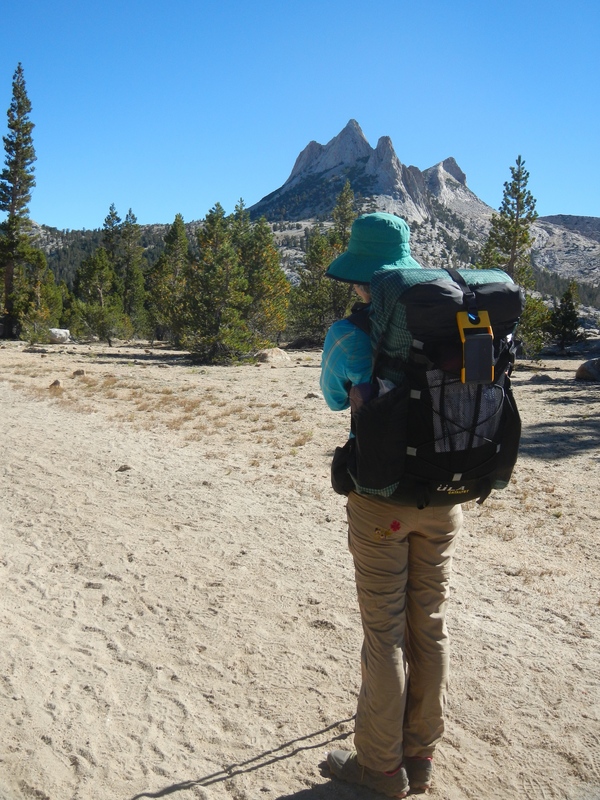 Resupplied at Tuolumne Meadows. We got there a little after 2:00 PM, having walked 9.8 miles, and I was really hungry. Didn’t pack lunch for the day, since we knew we’d be stopping at the Tuolumne Grill. The place was buzzing with activity, with hikers packing and repacking and eating burgers and fries. I had a most delicious, fresh Fuji apple and a veggie burger. The U. S. Post Office at Tulolumne Meadows is only open every hour on the hour for about 10 minutes. Is that legal? We had to wait until 3:00 for the window to open again. This cemented our decision to stay at Tuolumne instead of pushing on another 4 miles to somewhere farther along the trail. Now the pack seems super-heavy! 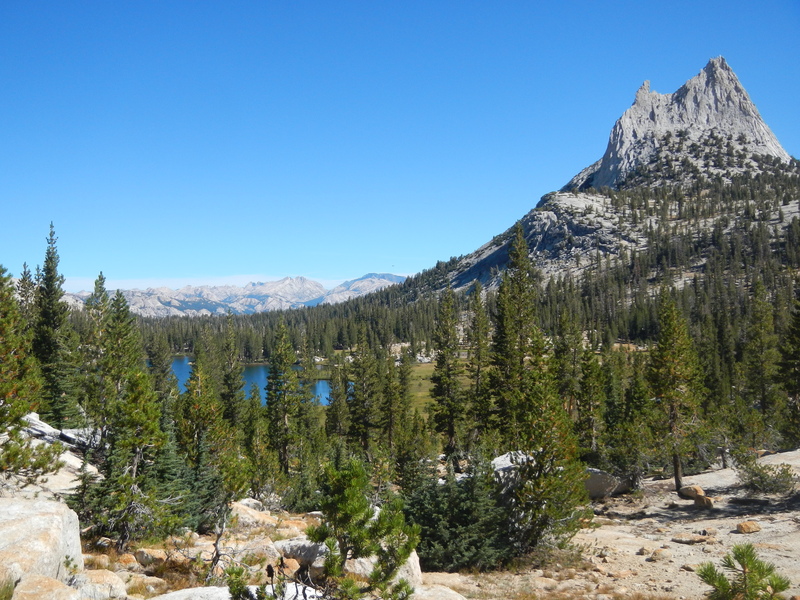 My first glimpse of Cathedral Lake, coming down from the pass. That’s aptly-named Cathedral Peak on the right. Beautiful! 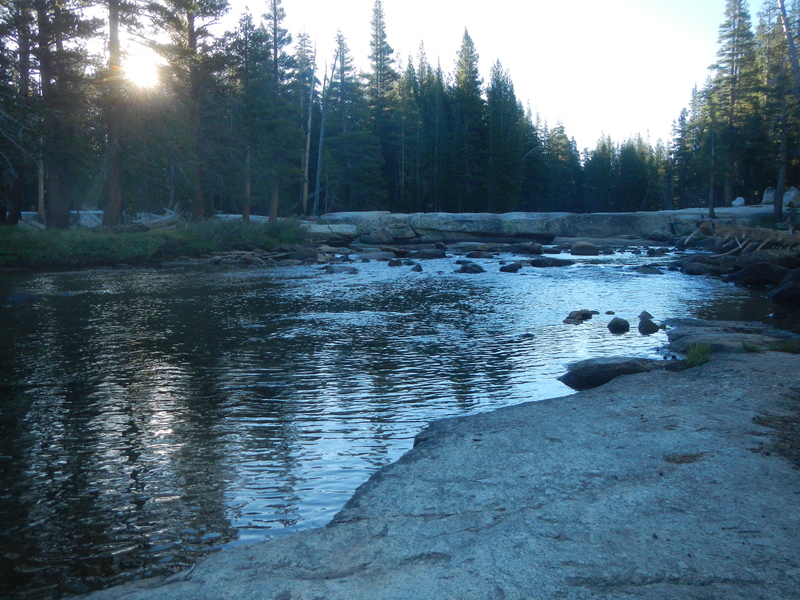 Sunrise on the Lyell Fork of the Tuolumne River. At Tuolumne Meadows, Lyell Fork slides over lovely gray and buff-colored giant slabs of smooth granite. Camping at the Tuolumne Meadows backpacker campground. It is a beehive! We were lucky to find a vacant campsite. Everyone goes to sleep by around 9:00 PM, which Betty refers to as “hikers’ midnight.” Betty and I went to a presentation by Ranger Karen Amstutz at the campfire circle in the evening. Ranger Karen sang songs and told stories, about her adventures in the park, and her family history. Her grandmother used to come to Yosemite every year, back when it took 4 days of traveling by stage coach from the San Fancisco Bay area, and stayed for 2 months every summer. I can only imagine what that must have been like, living in a big tent all summer and cooking over the fire. I didn’t last too long at the presentation, interesting as it was, as it was quickly past my new bedtime. Talked to Tom on the phone from the Tuolumne Meadows store parking lot. Really nice to be in touch! Last cell phone service until we overnight in Mammoth to resupply again. I like the ranger’s story about her grandmother camping out for 2 months every summer. It’s exactly what my father and his two brothers did with their grandparents when they were little boys in the 1920s. Cathedral Lake looks so beautiful. I think I need to do this hike some time in the future. The Fuji apple and veggie burger sounds pretty good to me too! It’s always amazing how good food tastes when you’ve been hiking all day.